TU25 Send Hot Pink Tulips. Hot Pink Tulips surrounded by folded leaves and delivered in water in a glass vase with a matching bow. Hot Pink Tulips are exciting and fun to enjoy. Lovely Oval Shapes of Tulip heads over light green foliages and stem that continues to elongates as Tulips open up slowly over days. 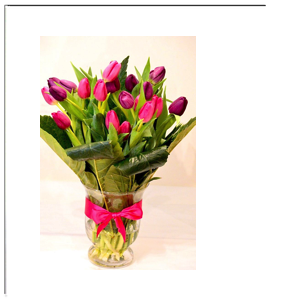 Tulips are popular as gifts for all occasions and available year round. Same day tulips available 365 days a year. Same day delivery of tulips throughout the year.